Hayk the Great (Armenian: Հայկ, Armenian pronunciation: [hajk]), or The Great Hayk, also known as Hayk Nahapet (Հայկ Նահապետ, Armenian pronunciation: [hajk nahapɛt], Hayk the "head of family" or patriarch), is the legendary patriarch and founder of the Armenian nation. His story is told in the History of Armenia attributed to the Armenian historian Moses of Chorene (A.D.410 to 490). The name of the patriarch, Հայկ Hayk, is not exactly homophonous with the name for "Armenia", Հայք Hayk’. Հայք Hayk’ is the nominative plural in Classical Armenian of հայ (hay), the Armenian term for "Armenian." Some claim that the etymology of Hayk' (Հայք) from Hayk (Հայկ) is impossible[why?] and that the origin of the term Hay ("Armenian") is verifiable. [clarification needed] Nevertheless, Hayk and Haig are usually[how?] connected to hay (հայ) and hayer (հայեր, the nominative plural in Modern Armenian), the self-designation of the Armenians. Armen Petroyan believes that the name Hayk can "very plausibly" be derived from the Indo-European *poti- ‘master, lord, master of the house, husband’. Hayk would then be an etiological founding figure, like e.g. Asshur for the Assyrians, etc. One of Hayk's most famous scions, Aram, settled in Eastern Armenia from the Mitanni kingdom (Western Armenia), when Sargon II mentions a king of part of Armenia who bore the (Armenian-Indo-Iranian) name Bagatadi ("Theodore"). Some sources claim that Hayk is derived from the Urartian deity Ḫaldi. Armenian historiography of the Soviet era connected Hayk with Hayasa, mentioned in Hittite inscriptions. The Armenian word Haykakan or Haigagan (Armenian: հայկական, meaning "that which pertains to Armenians") finds its stem in this progenitor. Additionally, the poetic names for Armenians, Haykazun (հայկազուն) or Haykazn (հայկազն), also derives from Hayk. Moses of Chorene gave Hayk's genealogy as Japhet, Gomer and Tiras, Torgom. Hayk's descendants are given as Amasya, Ara, Aram, Aramais, Armanak, Gegham, and Harma. Hayk was also said to be the founder of the Haykazuni Dynasty. According to Juansher, Hayk "was prince of the seven brothers and stood in service to the giant Nimrod (Nebrovt') who first ruled the entire world as king." According to Moses of Chorene, the Armenian noble family, the Haykazunis, which included a number of legendary kings (such as Aram, Ara, Skayordi, Paryur, and Vahe), descended from Hayk. "Hayk" by Mkrtum Hovnatanian (1779–1846). 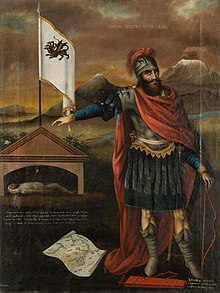 The legendary founder of the Armenian nation, standing next to the tomb of Bel, with Hayk's arrow still in Bel's chest. The map depicts the Lake Van region and Mount Ararat, with Noah's ark. According to the accounts of Moses of Chorene and Sextus Julius Africanus, the battle occurred between the dynasty of Hayk and a Chaldean Dynasty in its third generation that had control of Babylon and the remaining territory of Akkadia under King Belus, a symbolic Babylonian/Akkadian God of War, or founder of Babylon depending on mythological tradition. The conflict is said to of happened in 2107BC or earlier, and as Babylon existed since 2300BC, this is plausible therefore. Bel may symbolize the Gutian dynasty of Sumer, which ruled remants of Akkadia as a tyrannical power during a Mesopotamian Dark Age after the Akkadian Empire broke up in 2154BC. Gutia is also overlapping with Chaldeas territory. Hayk defeats Bel with an arrow. Hayk and his men soon discovered Bel's army positioned in a mountain pass (Moses of Chorene located the site as Dastakert), with the king in the vanguard. At Dyutsaznamart (Armenian: Դյուցազնամարտ, "Battle of Giants"), near Julamerk southeast of Lake Van, on August 11, 2492 BC (according to the Armenian traditional chronology of Navasard) or 2107 BC (according to "The Chronological table" of Mikael Chamchian), Hayk slew Bel with a nearly impossible shot using a long bow, sending the king's forces into disarray. The hill where Bel with his warriors fell, Hayk named Gerezmank meaning "tombs". He embalmed the corpse of Bel and ordered it to be taken to Hark where it was to be buried in a high place in the view of the wives and sons of the king. Soon after, Hayk established the fortress of Haykaberd at the battle site and the town of Haykashen in the Armenian province of Vaspurakan (modern-day Turkey). He named the region of the battle Hayk, and the site of the battle Hayots Dzor. The figure slain by Hayk's arrow is variously given as Bel or Nimrod. Hayk is also the name of the Orion constellation in the Armenian translation of the Bible. Hayk's flight from Babylon and his eventual defeat of Bel, was historically compared to Zeus's escape to the Caucasus and eventual defeat of the Titans. ^ Gōsh, Mkhitʻar (2000). The Lawcode (Datastanagirk') of Mxit'ar Goš. Rodopi. p. 112. ISBN 9789042007901. Retrieved July 6, 2016. ^ a b c Moses of Khoren; Thomson, Robert W. (1978). "Genealogy of Greater Armenia". History of the Armenians. Cambridge, Massachusetts: Harvard University Press. p. 88. ISBN 0-674-39571-9. ^ Petrosyan, Armen (2009). "Forefather Hayk in the Light of Comparative Mythology". Journal of Indo-European Studies. 37: 155–163. ^ International Standard Bible Encyclopedia; the ISBE uses the outdated terms "Aryan" for "Indo-European". ^ Russell L.L.D., Rev. Michael (1865). A Connection of Sacred and Profane History. William Tegg. p. 334. ^ Movses Khorenatsi, History of Armenia. Ed. by G. Sargsyan. Yerevan: Hayastan, 1997, pp. 83, 286. ^ dated by Mikayel Chamchian; Razmik Panossian, The Armenians: From Kings And Priests to Merchants And Commissars, Columbia University Press (2006), ISBN 978-0-231-13926-7, p. 106. ^ Gerezmank: the nom. pl, Gerezmans being acc. pl., "tombs"